UP Dangal continued their winning streak in season 3 of Pro Wrestling League 2018 on Friday when they beat Veer Marathas by 4-3 in a tight encounter. With this win, they have also entered the semis of the tournament. Marathas, on the other hand, have only 2 points on the table so far and are virtually out of race for semis. On day 11 of Pro Wrestling League 2018 season 3, UP Dangal continued to roll their winning juggernaut by beating Veer Marathas 4-3 in a tight battle at Siri Fort Sports Complex on Friday. UP have won all their four matches in the league so far and are one of the favourites to win the title. On the other hand, Veer Marathas have been able to assemble only two points in the season so far and are virtually out of the race for the semifinal stage. At one point, UP Dangal were leading by 4-1, however, Veer Marathas put up a good fight to win last two bouts of the night. However, their efforts were in vain as they could not hand UP their first defeat of the season. The match was witness to some great battles. All the eyes were on the clash between cousins Ritu Phogat and Vinesh Phogat, but in the end UP captain showed her dominance in the game beating her sister by 4-0 in 50 kg (women) category. In another exciting match, Bajrang Punia beat Amit Dhankad by 7-2 making a great comeback after losing his bout in the last match. The league is getting thrilling by each passing day with people thronging the stadium. Even celebs can’t keep themselves from action as Jackie Shroff was there at the complex today cheering for Veer Marathas. 08: 52 PM IST | So UP Dangal continue their terrific performance in the league. They have won all their four games of the season so far and will definitely be making it to the semifinal. That’s it from us today! Thank you for joining in. See you tomorrow, same place, same time! 08: 49 PM IST | Levan Bweiandze wins his bout by 4-4 by virtue of last points he gained. UP Dangal win the match by 4-3. 08: 43 PM IST | Not much has happened in the first round, Jamaladdin leading the bout by a mere 1 point, that too gained by passivity of his opponent. 08: 37 PM IST | All right people, make some noise for Veer Marathas’ Levan Bweiandze as he gets set to clash with UP Dangal’s Jamaladdin Magomedov! 08: 34 PM IST | Nemeth showed some fight back in the second round, but Vasilisa Marzaliuk manages to sail through! Aheavyweightt bout coming up as the grapplers of both teams will be fighting it ut in 125 kg (men) category next! 08: 29 PM IST | Vasilisa Marzaliuk of Veer Marathas leads the bout by 3-1. She looks unbeatable in the tournament, Can Nemeth do the unthinkable in the second round? Only time will tell! 08: 24 PM IST | Time for the second last bout of the night! In 76 kg ( women) category Vasilisa Marzaliuk of Veer Marathas’ will be battling it out with UP Dangal’s Zsanett Nemeth in the next encounter! Marzaliuk is an icon player and has won all her three bouts of the season so far. 08: 17 PM IST | Bajrang Punia take the bout by 7-2. and with that, UP Dangal have won the game against Veer Marathas, they will storm into semis having won all the four matches in the league so far! Marathas virtually out of the race for semis! 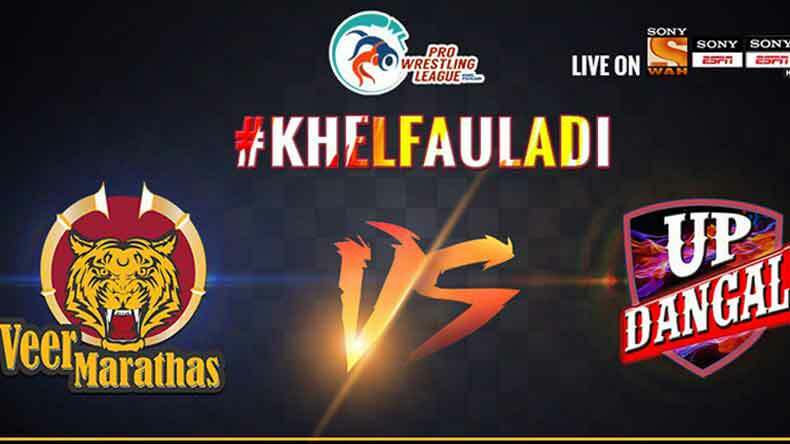 Let’s see if UP better the score or Marathas make a comeback as last two bouts of the evening are still lined up. 08: 11 PM IST | Punia leading the bout by 1-0 at the end of first round. Not a very aggressive fight so far, hope things become more thrilling in the second round. Dhankad would be expected to put up a fight in order to keep Veer Marathas alive in the game. 08:06 PM IST | In men’s 65 kg event, Veer Marathas Amit Dhankad set to clash with Bajrang Punia of UP Dangal. Marthas need a victory here, or they will lose the tie right away! 08:02 PM IST | Vinesh Phogat beats her cousin sister Ritu Phogat by 4-0. So Geeta’s forecast has come true, Vinesh showing her dominance. UP leading by 3-1. 07: 56 PM IST | Both the sisters know each other’s game so well they did not give much of a chance to each other. After much difficulty, Vinesh manages 3 points. Second round, up next! 07: 50 PM IST | Next up it is the battle between Ritu Phogat of Veer Marathas and Vinesh Phogat of UP Dangal in 50 kg (women). The much looked forward to battle of the night! Are you all set, we sure are! 97: 45 PM IST | Georgi Ketoev showed complete dominance in the bout winning by technical superiority 16-0. Vicky was totally clueless as Kitov continued to roll him over. Relief for Marathas as they win first bout of the night. 07: 41 PM IST | In men’s 92 kg category, Georgi Ketoev of Veer Marathas will be clashing with UP Dangal’s Vicky. Both the grapplers warming up at the moment. Veer Marathas might be gaining first points of the night, courtesy Kitov’s sensational run so far. 07: 33 PM IST | Geeta lives up to her name, beats Ritu by 5-0. She managed to gather 4 points in the second round making a great comeback after a slow first round. Ritu is yet to win a bout this season. Geeta says she is happy to win her bout despite being injured. An exciting bout between Vinesh Phogat and Ritu Phogat will take place today and Geeta thinks Vinesh will be the favourite to win that. 07: 27 PM IST | Geeta Phogat is leading by 1-0 at the end of first round, that too has been earned on the grounds of the passivity of other grappler . She seems to be missing her magic touch here and is playing with a heavily strapped knee. Ritu has a great chance to win this under such circumstances. 07: 22 PM IST | In 62 kg women category, Veer Marathas’ Ritu Malik is set to battle it out with UP Dangal’s Geeta Phogat. An exciting bout on the cards for sure! 07: 15 PM IST | Rathi banked upon his superb form and made a lovely comeback to win his bout against Shravan by 7-4. Jubilations in UP camp and why not! Meanwhile, Jackie Shroff has entered the stadium! Give him a hand, people even if you are not in the stadium! 07:09 PM IST | The first round of the bout has concluded and Shravan has taken the lead against Nitin 3-0. Now, that was unexpected! Can Nitin make a comeback? 07: 04 PM IST | All right then, the first bout of the evening will take place between Shravan of Marathas and Nitin Rathi of UP Dangal in men’s 57 kg event. Nitin has been in good form so far in the league, let’s see what moves he has in store for us today! 07: 02 PM IST | Veer Marathas have won the toss, block 74 kg (men) category. UP Dangal block 57 kg (women) category in return. 07:01 PM IST | Toss time, people! Captains on the field, who will win, let’s see! 06:24 PM IST | We have got some exciting news for PWL fans, Jackie Shroff will be at the stadium as well today to support Veer Marathas. Well, let’s see if his presence manages to change fortunes of struggling Marathas! 06: 18 PM IST | Hello and welcome to the live coverage of the match between Veer Marathas and UP Dangal. Toss to take place at 6:50 PM. Check out some of the pictures till the action begins and keep yourself engaged, peeps!